Here Are All The Winners Of The 2016 Emmy Awards! 'Game of Thrones' wins BIG. No shocker here! The People v. O.J. Simpson: American Crime Story and Game of Thrones topped the 2016 Primetime Emmy Awards. The TV adaptation of disgraced sportsman O.J. Simpson's murder trial headed into the awards with a stunning 22 nominations, and quickly racked up the trophies, including Outstanding Limited Series. 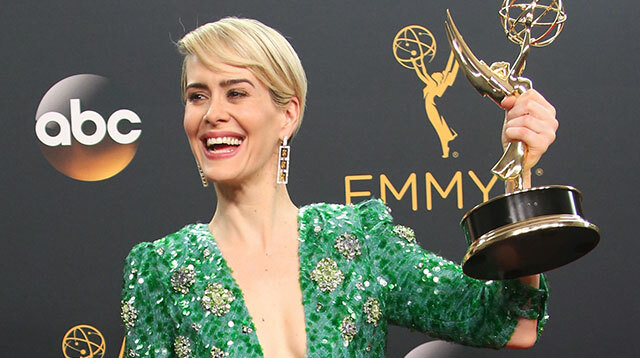 Sarah Paulson was named Outstanding Lead Actress In A Limited Series Or A Movie for her portrayal of prosecutor Marcia Clark, who accompanied the star to the Emmys as her date for the night, while Courtney B. Vance beat co-star Cuba Gooding, Jr. to take the Outstanding Lead Actor honor for his role as Simpson defense attorney Johnnie Cochran. Sterling K. Brown was also celebrated as Outstanding Supporting Actor, as writer D.V. DeVincentis. Game of Thrones, based on the hit fantasy books by George R. R. Martin, was another big winner, landing Outstanding Drama Series, Outstanding Directing for a Drama Series, and Outstanding Writing for a Drama Series, but its cast members lost out on the acting accolades, which went to Rami Malek (Mr. Robot), Tatiana Maslany (Orphan Black), Ben Mendelsohn (Bloodline), and Dame Maggie Smith (Downton Abbey). Meanwhile, Veep held on to the Outstanding Comedy Series title for a second consecutive year, and its star Julia Louis-Dreyfus scored her fifth consecutive win for Outstanding Lead Actress. The victory was a bittersweet one for the former Seinfeld star, who tearfully dedicated the prize to her father William, who died on Friday, aged 84. Jeffrey Tambor was named Outstanding Lead Actor again for Transparent, after previously winning the 2015 award. There were also special tributes from Tambor to his late pal Garry Shandling, and from Henry Winkler, who remembered his Happy Days creator Garry Marshall, before the ceremony's annual In Memoriam segment, which also honored stars like David Bowie, Alan Rickman, Gene Wilder, Prince, Muhammad Ali, Patty Duke, Anton Yelchin, Doris Roberts, Natalie Cole, Merle Haggard, and Glenn Frey, who have all died in the past year. The 68th annual Primetime Emmy Awards, which celebrate the best in TV, were hosted by Jimmy Kimmel at the Microsoft Theater in Los Angeles. Outstanding Directing for a Variety Special: Alex Rudzinski and Thomas Kail, Grease Live! Outstanding Writing for a Variety Special: Patton Oswalt, Patton Oswalt: Talking for Clapping.